Spend your holiday in the best way– spend it in Minsk! 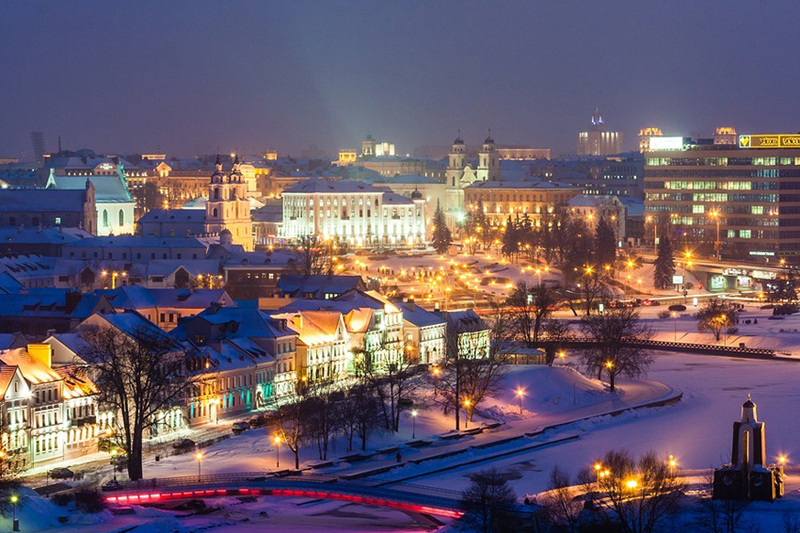 For fun and parties lovers, for people, who like something new and unusual, for researchers and travellers … Our tour «The Lights of Big City» will help you to spend the best weekends in Belarus. Minsk is the capital of Belarus. It is an ancient, but always young European city. This city is ideal for spending unbelievable weekends. You will be attracted by old architecture, you will walk along our ancient city with magical atmosphere of old streets, tiny cafes, restaurants with national dishes and souvenir shops. You will see our graffiti, unusual monuments and memorials. You will see the mysterious house, which was the house of Lee Harvey Oswald. Yes! This is the person, who killed an American president John Kennedy (according to one of the version) and this man lived and worked in Minsk as a factory worker. You will have a lot of different entertainment: Opera and Ballet house, circus, museums and art galleries, aqua parks and a unique opportunity to see Minsk from the viewing platform of national Library (it is a unique building in the shape of polyhedron-diamond and all walls are big LED screens and in the evening it is a wonderful spectacle) and make great selfies. For risk lovers there are modern casinos. Minsk is a very «green» city. You can walk around our city or go boating in the centre of the city and also visit Botanical Garden. Numerous restaurants and cafes with delicious cuisine will open doors for you. There are a lot of modern shopping centers, where shopping lovers can find fashion collections of famous brands and also our National goods, for example lovely linen products, natural cosmetics, delicious pastry. Our city doesn’t sleep – there are different night clubs, where you can have fun and dance all night. From any place in Europe you can get a plane and after 2-2,5 hours you will be in our hospitable and beautiful city and here you will find amazing adventures. The first day (Friday) – arrival in Minsk, transfer to the hotel, evening walking around Minsk and Old City (including Trinity Suburb, Upper town, Minsk castle, Suburb Rakovskoe, which create historical center of Minsk, where you can see interesting monuments and architecture, Orthodox and Catholic churches. Trinity Suburb is picturesque and old place on the river bank of Svisloch in the centre of Minsk. Cozy streets and painted in gentle colours houses with tile roofs have become symbols of Minsk, which are printed on souvenirs and sweets. Upper town is the centre of Minsk. In 1499 Minsk got Magdeburg right and after that stone town hall was built on the central square and it also was rebuilt several times. You also can see sights of Upper town: inn yard, St Mary’s Cathedral, museum of the History of Minsk, Holy Spirit Cathedral. In Suburb Rakovskoe you will see St. Peter and Paul Cathedral, Restaurant-brewery in old building. After that you will enjoy dinner and free time. The third day (Sunday) – breakfast. Excursion to the historical park « Sula». In Belarus this is the first park and museum of interactive history. This park is located in 49km from Minsk on the picturesque shore of Sula lake. Here you will feel a new atmosphere, where there are no dimensions between material and mental, where you can find connection with our past… Here you can feel refined and fascinating atmosphere of Belarusian Homestead of 18 th century. The complex «Park of the History of Sula» is the center of culture and social life. Looking around the homestead and walking around the park. If you want, you will have an opportunity to ride a horse. Lunch is national Belarusian cuisine on the territory of the homestead. Departure to Minsk, arrival. Free time. Entertainment of your choice. Dinner. The fourth day (Monday) – breakfast, leaving hotel, some free time, transfer to the airport. And goodbye, Minsk. We are waiting for you again. Come with your friends and spend great time in Minsk. *We can change the program according to your preferences. Our company also can book or buy theater or concert tickets in advance. And it is about all events, which can happen during your trip. ** Tour price depends on residence ( from economy-accommodation to VIP- 5*hotels) and the number of people.